It’s only natural for humans to want to share the same food they eat with their dog, so when those soft, irresistible eyes peer up at you from beneath the Thanksgiving Day table, how can you resist? The good news is that turkey can be a healthy treat for dogs, but only if it’s fed properly. If you are wondering how to give your best friend the special meal he deserves without risking illness, consider this expert advice. Turkey meal is a common ingredient in commercial dog food. It’s different than the fresh cuts of turkey you might give your pet at home, but according to the veterinarians at PetMD, it’s a great source of concentrated muscle-building protein and can serve as a healthy alternative for dogs with allergies to food that contains beef or chicken. The primary problem with feeding home-roasted turkey is that it’s tempting to give your dog parts of the bird that are hard for him to digest and that can lead to an upset stomach, constipation, diarrhea or injury. Veterinarian Marty Becker strongly advises against offering bones, warning that they become sharp when chewed and can cause injury to your dog’s mouth or worse, perforate his intestinal tract causing pain, bleeding, and potentially serious infections. Other ingredients added to turkey dishes made for humans can also be hazardous. The experts at Canine Journal point out that popular herbs and spices such as garlic, onion, and chives are toxic to dogs and when ingested, can have serious health repercussions including red blood cell damage and severe anemia. Perhaps the greatest risk to your dog’s health, however, is Acute Canine Pancreatitis. What is Acute Canine Pancreatitis? The pancreas has several key functions, but its primary responsibility is to produce the powerful digestive enzymes needed to break down food. When the pancreas suddenly becomes inflamed, it’s called acute pancreatitis and it can lead to life-threatening complications. Owners should not confuse this condition with chronic pancreatitis. Acute pancreatitis has many causes including genetic predisposition, diabetes, bacterial infections, and certain medications, but according to the Pet Health Network, it is most commonly the result of eating high-fat table scraps. Every year, veterinarians see a rise in cases around the holidays after dogs have ingested the fat, skin and bones left over from a turkey. Lean turkey, especially white breast meat, won’t generally cause illness in dogs that are otherwise healthy. What are the warning signs that something is wrong? Like in people, any food your dog is not accustomed to having may cause vomiting and diarrhea, but it can also signal the onset of acute pancreatitis. This short YouTube video produced by the Pet Health Network describes the symptoms of pancreatitis in detail and can help you troubleshoot your dog’s symptoms. How is Acute Canine Pancreatitis treated? Your veterinarian will begin with a complete examination including blood tests and x-rays to verify a diagnosis. According to the Merck Veterinary Manual, treatment consists mostly of symptom management and the prevention of serious complications. For dogs with mild symptoms, the doctor may suggest monitoring at home, while substituting regular dog food with a bland diet, or withholding food entirely, for at least a few days. If symptoms are severe, your dog can easily become dehydrated and hospitalization for intravenous fluid replacement may be recommended. Medications to control vomiting and ease pain will be given. After initial treatment, residual symptoms can persist for weeks after. To get your dog eating again without discomfort, a low-fat diet will be prescribed along with powdered pancreatic enzymes that will help make food more digestible. Most dogs recovery fully from episodes of mild pancreatitis, however, in severe cases, damage to the organs surrounding the pancreas may have occurred. In this situation, your dog will be more susceptible to future bouts of illness, necessitating a permanent change to a low-fat diet and regular, long-term health monitoring. 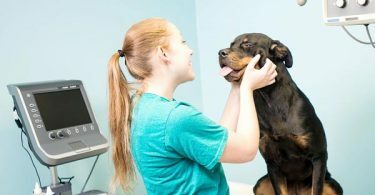 Breeds including Miniature Schnauzers, Yorkshire Terriers, Cocker Spaniels, Dachshunds, and Poodles are genetically predisposed to developing acute pancreatitis, making prevention even more critical. Is ground turkey good for my dog? According to Elton Dunn in an article for The Nest, ground turkey can be as good for dogs as the whole turkey, but it is important to watch the fat content and how it is prepared. Ingredients like onion, garlic, and chives used to make ground turkey dishes tasty for people can be toxic to dogs, even in small amounts. The safest bet is to use plain, lean ground turkey that has been boiled or pan-fried with any excess fat removed. Are turkey bacon and deli turkey healthy for my dog? Processed meats can be questionable to feed because of a large number of ingredients that typically go into them. The quality of lunch meats can vary and brands without potentially harmful ingredients are probably safe in small amounts. Be especially cautious of salt, however, when feeding these treats to large dogs. It can promote excessive thirst that leads to water gulping and potentially fatal bloat. How much turkey is safe for my dog to eat? The most important thing your dog eats is his nutritionally-balanced dog food. Kibble may not look like it contains important vitamins and minerals, but it does. Everything else a dog eats, even if it is nutritionally sound like a lean turkey, decreases the total amount of these critical nutrients and can lead to malnutrition. As an occasional treat, turkey is a healthy choice, but it should not be fed in amounts that discourage your dog from eating his regular diet. Dogs who are overweight should receive only bite-size portions. How can I safely feed my dog turkey? – Avoid scraps. This includes the carcass, skin, bones, and fats. Feed only lean meat. The white breast is the lowest in fat content. – Try just a small amount first before making it a regular treat. Any food that is new to your dog has the potential to cause allergy symptoms, an upset stomach, or diarrhea. By feeding small amounts, you’ll minimize any damage if it occurs. – Cook meat thoroughly or used fully precooked versions. Dogs are as likely to suffer from deadly food-borne illness as humans. – Use plain meat only. Avoid meats with herbs, spices and other flavor enhancers that can be potentially toxic. – Avoid accompaniments like mashed potatoes, stuffing and gravy with high sodium and added spices. – If turkey put in a dog bowl isn’t consumed within two hours, throw it away. Human rules for food safety apply. – Never feed a dog spoiled turkey. The idea that their digestive systems can handle it is a myth. Your dog is not wild. – Be especially cautious when feeding processed turkey products to puppies and senior dogs. They are less likely to tolerate the high sodium content due to their age. – Turkey is good for dogs of all sizes from Chihuahuas to Great Danes, but feed an appropriate serving size to avoid obesity. – Check with your veterinarian if your dog takes medication or has an underlying condition. Adding protein to a healthy dog’s diet is beneficial, but may make a dog with kidney disease ill.
What should I do if my dog ate the wrong turkey product? 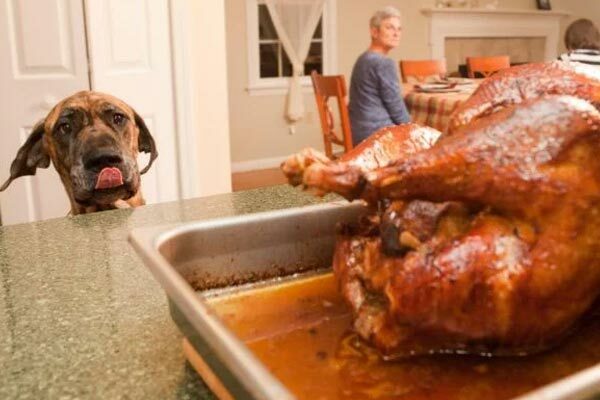 Despite conscientious efforts, your best friend may not be able to resist the turkey carcass on the counter when you are not looking. 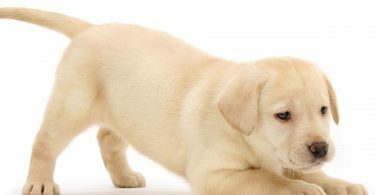 If that happens, Vet Blog’s Dr. Scott Nimmo advises against trying to induce vomiting because sharp bones can damage the stomach and esophagus on the way back up. Instead, offer your dog a few pieces of bread — they can form a protective layer around small pieces of bone, easing them out of the alimentary canal without harm. – With a syringe, give your dog one tablespoon of hydrogen peroxide for every 20 pounds of body weight, getting the liquid as far back in the throat as possible. – Wait ten minutes. Repeat the process if vomiting did not occur. – Call your veterinarian after two unsuccessful attempts. Never administer more than recommended except under the advice of a qualified professional. If hydrogen peroxide isn’t available, syrup of ipecac is a good substitute, but it’s harsher and can promote ongoing vomiting, even after the offending substance has been eliminated. Be prepared for a trip to the veterinarian for aftercare. How can I take care of my dog’s upset stomach at home? – The most effective way to treat vomiting and diarrhea at home is to give your dog’s stomach a few days off. Fasting is very safe for short periods and allows an inflamed, irritated digestive tract to heal. Making sure that plenty of fresh, cold water is available is a must. – If fasting doesn’t go over well with your dog, a bland diet is a good alternative. A mixture of lean, cooked hamburger or chicken mixed with plain white rice in small amounts is easy to make and soothing for your dog to eat. If you can’t cook, use plain meat baby food without added ingredients. – Small amounts of plain, unflavored yogurt can help ease painful gas by replenishing an ailing digestive system with helpful probiotic bacteria. – If your dog won’t eat, plain chicken or beef broth may help. Just choose a brand that is unseasoned and low in sodium and fat. – Cooked, mashed sweet potato contains the same type of carbohydrates that are known to ease an upset stomach and gas in humans. Finally, if symptoms persist for more than 48 hours, it could signal a more significant problem and by that point, your dog may be getting seriously dehydrated. Call your veterinarian. What are alternatives to a turkey dinner? Dogs with a history of developing gastritis or pancreatitis after eating people food will be happier and healthier without it. When the family sits down for Thanksgiving Dinner and the begging begins, have an assortment of small dog treats to offer as a compromise. They may not look or smell as good to you, but they will be scrumptious to your dog. If you can’t help yourself and turkey is a must, use a strategically small amount and make it count. Shred white turkey and mix it in with a larger amount of dog food. It will still be appealing and there will be enough to both keep him busy and satisfy his appetite while keeping portion size under control. Any dog with an owner like you is fortunate you care enough to learn more about how to safely feed them turkey and other treats. For expert care, always see your veterinarian, but hopefully, these tips will allow you to successfully share your next Thanksgiving without misgivings.